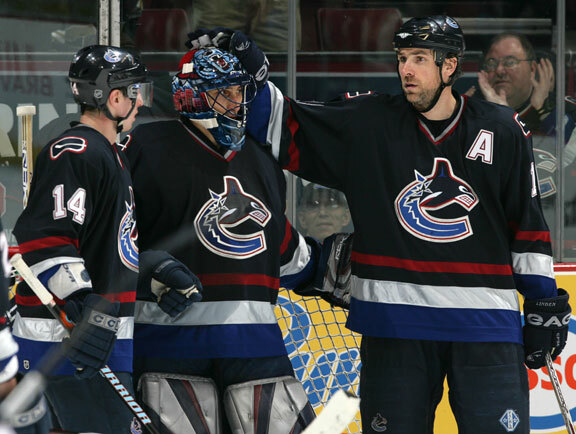 Trevor Linden and Roberto Luongo were luckier than most as junior hockey players. They are the only current members of the Vancouver Canucks who had the chance to play for the Memorial Cup - and each of them had the opportunity to compete in a pair of tournaments. And while the two have that much in common, their Memorial Cup experiences were anything but similar. Linden had the tremendous fortune of winning the Cup both times he played for it as a member of the Medicine Hat Tigers while Luongo made two appearances with two different Quebec Major Junior Hockey League teams and didn't win a single game. Yes, as hard as it is to believe, Luongo, who's made a name for himself shutting down and shutting out opponents at the National Hockey League level was himself shutout when it came to victories on the Canadian Hockey League's biggest stage. For Linden, success came early in his junior career and he had a big hand in it. As a fresh-faced 17-year-old, the venerable Canuck veteran scored twice in the championship final as Medicine Hat beat the host Oshawa Generals 6-2 to give the Tigers their first ever Memorial Cup crown in 1987. "We were fortunate enough to win both times so those are some pretty special memories. For me, it was the whole magnitude of it (the tournament)," says Linden, a co-chair of this year's event at the Pacific Coliseum along with former Canuck captain Stan Smyl. "I was a kid from Medicine Hat, our first Memorial Cup was in Oshawa. It's a lot bigger now, but at that time, to go there and to realize that this was a national championship and you realize the whole spectrum of it, it takes you back a little bit. It was a very special feeling." A year later, Linden and the Tigers travelled to Chicoutimi, Quebec to defend their title. And they did just that, but they did it the hard way spotting the Ontario League champs from Windsor a 3-0 lead in the first period of the final before roaring back for a wild 7-6 victory. "The thing about the Memorial Cup is that it's like a series of game sevens and everyone knows that when you get into a game seven, you need everything to go right whether it's bounces, goaltending, power play," says Linden, who knows a thing or two about the topic having scored the winner in the Canucks 4-1 victory over Dallas in the seventh game against the Stars last month. "You can have a great team, but if you have an off-night, you can go home so you have to be good and you have to get some breaks. That's what makes it great." Of course, it was a month after that second Memorial Cup title that Trevor Linden and the Vancouver Canucks would form their great and lasting relationship with the Canucks selecting Linden with the 2nd overall pick in the 1988 NHL Entry Draft. For Roberto Luongo, the Memorial Cup experience wasn't nearly as satisfying. He back-stopped a Val d'Or team which featured players like Nashville's J-P Dumont and Montreal's Steve Begin to the 1998 tournament in Spokane and a year later was back again, this time, with his Acadie-Bathurst teammates like Anaheim's Francois Beauchemin and Nashville's Ramzi Abid making the trek to Ottawa. And neither time was Luongo able to post as much as a single victory in six Memorial Cup games. "The two years were two very different teams. The first year we got scored on like five, six goals a game and the second year we scored three goals in the whole tournament," Luongo recalled for canucks.com before heading home for the summer. "We had good teams going in but I guess not strong enough to compete with the other leagues." Years later, Luongo is able to smile about the experiences knowing that despite the losses, simply having the chance to compete with the best players and teams in his age group only served to make him the goalie he has become today. "Definitely. Any experience whether it's good or bad is something that you should take and use it and put on your side for the future," he says. "Obviously I didn't have great success at the Memorial Cup, but those are experiences that not a lot of people can say they have." There's no question the Memorial Cup is a tough tournament to win as the Vancouver Giants, Medicine Hat Tigers, Plymouth Whalers and Lewiston Maineiacs will discover for themselves this week. 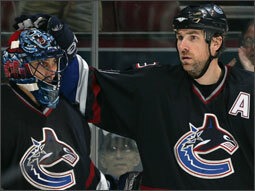 One team will prevail and get to feel everything Trevor Linden did all those years ago. The others will know how Roberto Luongo felt in his two trips to the tournament. But all will be better players for having gone through the experience.